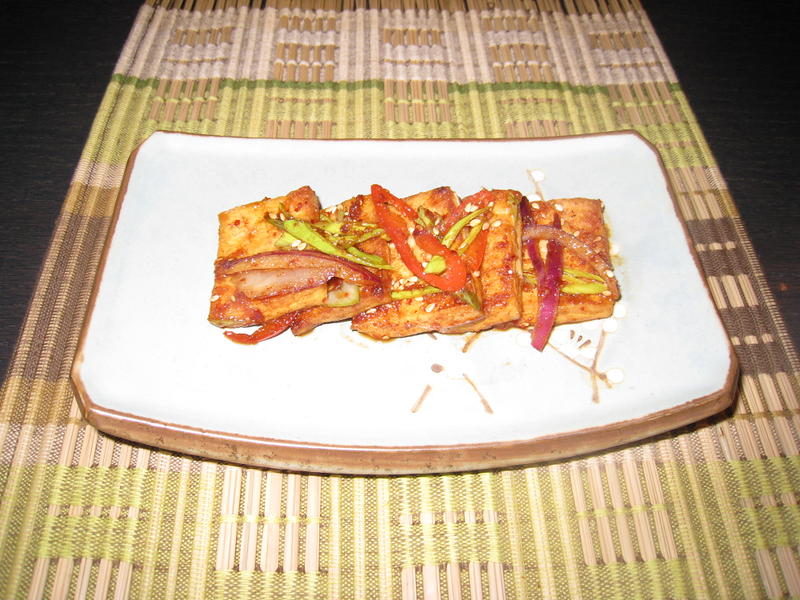 Jorim refers to dishes made of meats, seafood, vegetables or tofu in a mixed sauce cooked by simmering for a time. The sauce for Jorim is mainly Ganjang (soy sauce). In olden times in Korea during the hot summer weather this salty soy sauce could prevent food going bad. You can buy Tofu from any English supermarket. I bought this from Waitrose. Our local Korean supermarket sells Tofu at a better price and I think it is much firmer in texture than the Waitrose one. This dish is so easy to make and the uncooked tofu contains only around 200 calories. By comparison, same amount of beef contains around 650 calories. So you can see how healthy this dish is. If you never made a dish using “tofu” then try this dish first. You are going to love it! Try to prepare all the ingredients before you start cooking then it is easy to follow the instructions here. Pan fry the sliced Tofu until the colour becomes golden brown on both sides.You can sprinkle a little bit of salt and black pepper seasoning if you want. Mix all these ingredients in a bowl except the spring onions and shallots which will be added after frying the tofu. Then add all the spring onions and shallots like this picture. Finally sprinkle the sauce we made and simmer them for 1-2 minutes on a medium high heat.Serve with a bowl of rice and a glass of beer for yourself! Well done! Cut the tofu in 2 horizontal line and then slice them into 8-10 pieces. Be preparing all the ingredients in separated bowls except some spring onions and shallots. Finely slice shallots and spring onions and be preparing them in a bowl. Pan fry both side of the tofu until they become golden brown on medium low heat. Meanwhile, mix all the ingredients in a bowl except shallots and spring onions. When the tofu is golden brownish in both side then sprinkle shallots and spring onions and then lastly the sauces. Simmering them for 1-2 minutes on a medium heat. Serve it with a bowl of steamed rice or eat it as “ Anju” with drinking.